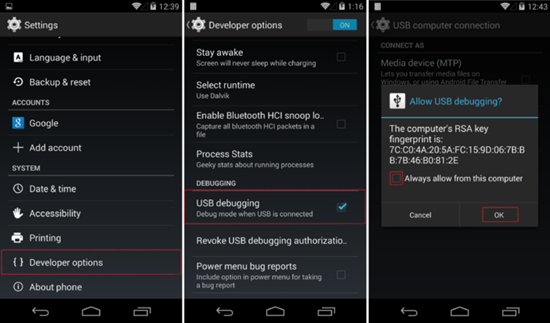 Home > Android Recovery > How to Enable USB Debugging on Android in 3 Situations? What is USB Debugging? USB debugging is a frequent term which we hear every now and then, and it is one thing that you really need to know if you are an Android fanboy. This is an essential option that has been offered by any Android device that helps to extend the functionality of your usage via your PC or laptop. The primary function of USB Debugging is to grant you access to your Android phone and gives the room for future enhancements on your device without sacrificing performance. These days with further versions of Android, security is getting tighter and so are the options on your device. Previously there were direct options to enable USB debugging and nowadays you have to first enable Developer Options to breakthrough the USB debugging option. Developer Options is a great way to enhance the functionality of your phone, but improper use of it could affect the way your device functions. Hence, you should know exactly what you are doing before proceeding any settings. And we advise you to avoid configuring any other settings in Developer Options after enabling USB debugging. Whenever you trying connecting your Android device to the computer or laptop, your phone must always asks you to enable the USB debugging first before it can be recognized by the computer. 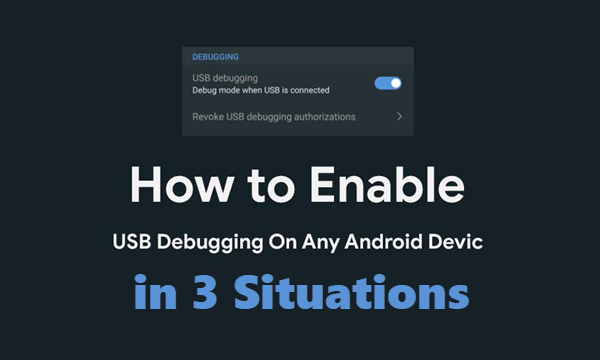 So in this section, we will firstly tell you how to enable or disable the option of USB Debugging on your Android device running from Android 2.3 to Android 9.0. Step 1: Go to “Settings”, and then find the Developer option. After having found that, constantly tap on the Build number seven times, and then you will get a short pop-up in the lower area of your display saying that “you are now a developer”. Step 2: Having enabled the Developer options, go to it and find the USB Debugging options. Now, just simply enable the USB Debugging to use the next options for future customizations. After that, you can enable and disable USB Debugging whenever you want by going to Settings -> Developer Options -> Debugging -> USB debugging. Navigate to Settings -> enable Developer options. Once you have enables developer options, you just simply scroll all the way down until you see the USB Debugging option, and check it. 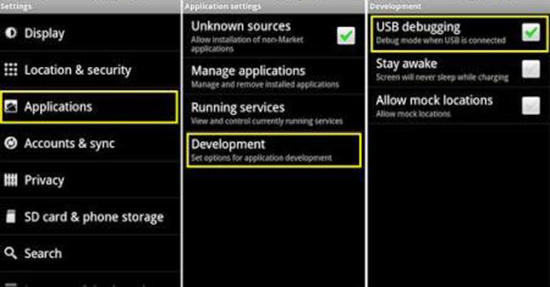 Navigate to Settings -> Applications -> Development -> USB Debugging -> Enable it. In order to pick out the right way to enable USB debugging on your Android mobile, you should first find out what version of Android you have on your device. To do that, please go to Settings and scroll down to the bottom to find the About Device option. Tap on it and you should find various details of your phone. Among them, find Software info or Android version and they will tell you your Android version. Enabling USB debugging indeed helps a lot for developers and enthusiasts who want to enhance the usage of their Android smartphone. Android developers require this feature most frequently to test their Android applications on their own Android device, or to recover deleted data on Android with Android Data Recovery software. 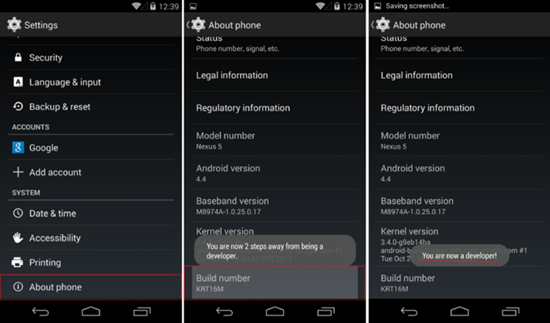 For further customizations on your Android device such as rooting Android phone requires this option to be enabled. So, this simple step can be a lot handier than you think later. Now, there can be another situation if the touch screen on your Android device gets broken, but the screen might still light up. Now, if in this situation you want to enable USB debugging without a working screen, you can still use a USB OTG and a mouse to control your smartphone with broken screen easily. The USB OTG (USB On-The-Go) is a technology which allows you to connect any external device such as a mouse, USB drive, keyboard, etc to your Android smartphone or tablet through a USB Type-C or a micro USB port that is given on your device. For example, you can connect a mouse to your smartphone via an OTG cable and use the mouse to control your Android device without even touching the screen. But this OTG technology is not supported on every Android smartphone. So before proceeding, you should actually check whether your broken screen smartphone is OTG compatible or not. You can just refer to your user manual of the smartphone that you own or just simply Google that if your device supports USB OTG connection or not. 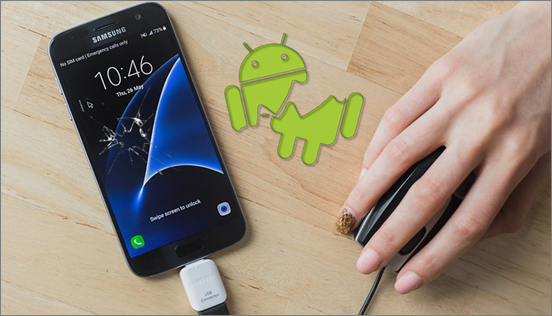 Here are the simple steps to follow so that you can enable USB Debugging on your broken screen Android smart device with USB OTG. If you want to know more about how to use USB OTG on broken screen Android, you can refer to this post. Step 1. Using an OTG adapter to connect your Android smartphone with any mouse. Step 2. Having done that connect your broken smartphone to your PC or laptop and the smartphone gets recognized after the drivers get installed. Step 3. Now, just left click on the mouse to unlock your smartphone and then head over to Settings and turn on USB Debugging. Please refer to part 1 if you have any problems. With these easy steps you can directly enable the USB Debugging settings and increase the functionality of your device even if your touch screen might not be working on your Android smartphone. Have you ever thought if it is possible to enable USB Debugging on your Android device remotely from your computer or laptop? The straight answer to the question is a simple no. Well, there is no immediate way to enable the USB Debugging option directly from your PC/Mac. But you can still use the ADB commands or via terminal to enable USB Debugging on Android through your PC or laptop. On Android OS, there’s a tool named SDK, which can be used to debug problems with your Android device. Android Debug Bridge (ADB) tool is one of the parts of the SDK tool. With this ADB tool on your PC or laptop, you can connect as well as communicate with your Android smartphone via a USB cable and execute a series of commands for various functionalities. Step 1: Firstly, you have to install the ADB tool on your PC or laptop. You can download minimal ADB and Fastboot tool here. Step 2: Normally the ADB needs to communicate with your Android device via USB Debugging. As the USB debugging option is turned off, you will have to boot your device into the ClockworkMod Recovery mode by holding the Power button + Home + Volume Up or Down which depends on the model. Step 3: When your smartphone enters the recovery mode, launch the ADB tool and then connect your Android device to PC or laptop via a USB cable. Step 4: Now go to the command prompt and type: adb_enabled. 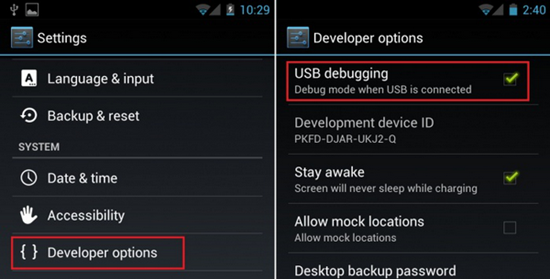 Now the USB Debugging option gets enabled by default and now you can use your Android device without any problem. So, here were the simple procedures for three situations which might seem a bit complex, but if you follow the above-mentioned steps blindly then you can easily get things done without facing any hiccups whatsoever.